Epsom Salt with NDC 49035-602 is a a human over the counter drug product labeled by Walmart, Inc. 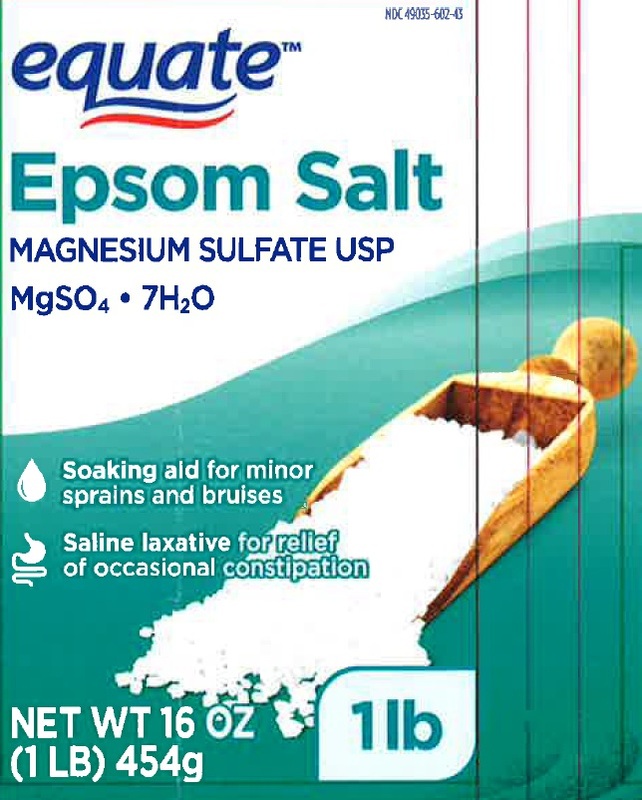 The generic name of Epsom Salt is magnesium sulfate. The product's dosage form is granule, for solution and is administered via oral; topical form. Dosage Form: Granule, For Solution - A small medicinal particle or grain made available in its more stable dry form, to be reconstituted with solvent just before dispensing; the granules are so prepared to contain not only the medicinal agent, but the colorants, flavorants, and any other desired pharmaceutic ingredient. Tamper Evident Packaging:Caution: This package has been sealed for your protection. Do not use if package is open, torn or mutilated. Ask a help professional before use. For external use as a soaking aid for minor sprains and bruises.DIRECTIONS: For a relaxing bath/soak, generously sprinkle Equate Epsom Salt into warm, running bath waterCAUTION: If prompt relief is not obtained or there is evidence of infection, discontinue use and consult your physician. Hot or warm soaks should not be used by individuals with diabetes except on the advice of a phsician. Keep out of reach of children.